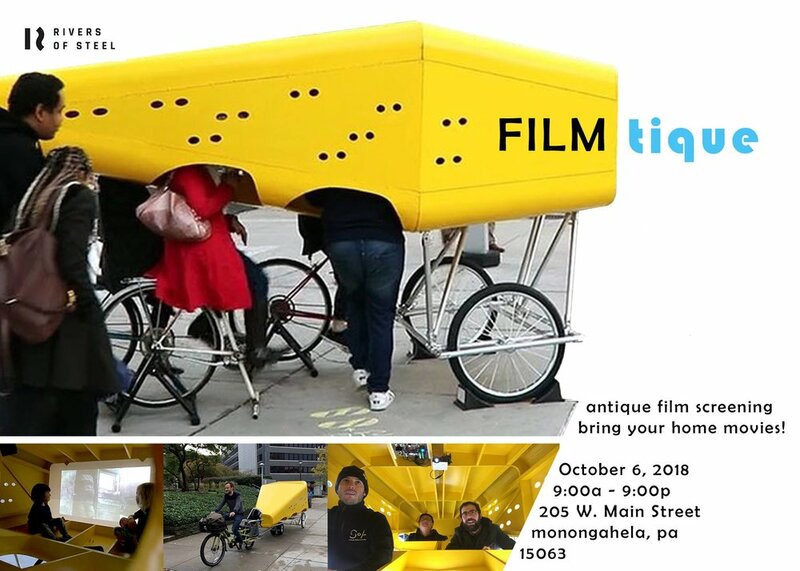 Rivers of Steel Arts is excited to partner with the Carnegie Mellon University department of Architecture and Urbanism and the Monongahela Main Street Program to present Filmtique, a pop-up film project to be held in conjunction with Monongahela’s annual Fall Fleatique on the Mon scheduled for Saturday, 6 October 2018 from 9:00am–9:00pm. Filmtique is a celebration of antique film and shared community memories that serves to entertain and educate audiences by inviting community members to screen their own home movies, and provide historical context of film as a medium. On October 6, beginning at 9:00am Rivers of Steel Arts will welcome interested parties to bring in their home movies on either Super8 or 16mm film stock to be screened at 205 W. Main Street in downtown Monongahela. Filmtique will also feature screenings of “found footage” films from local artists and the opportunity to experience the pedal projection machine Hiding In Plain Sight (pictured on the flyer) created by STUDIOGRUBER. The event is free and open to the public. Come share in the joy and novelty of analog film projection, an antiquated technology.